Barclays Center, which is the first new major sports and entertainment indoor arena in New York to open in more than 40 years, offers various levels of luxury. 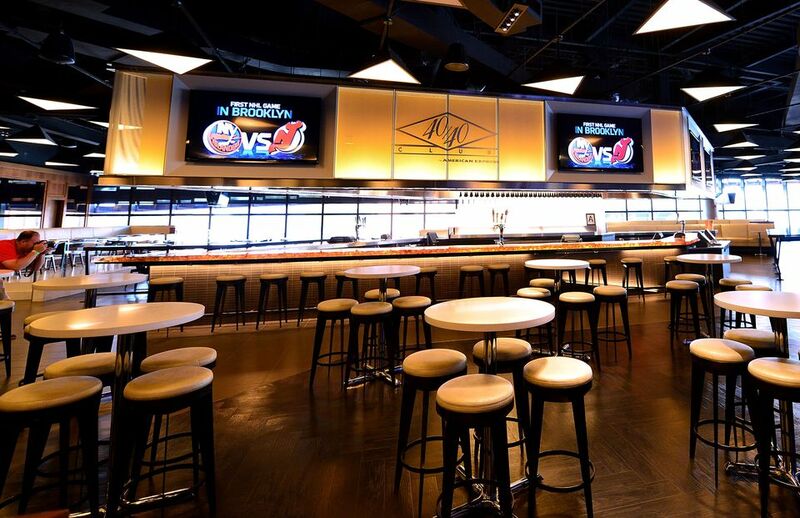 You can enjoy over-the-top luxury to just plain nicer-than-average seats and environments for Brooklyn Nets and New York Islander games as well as other types of entertainment events. Formerly known as the Vault, Billboard Lounge is where one finds the most expensive accommodations. The 5,500 square foot space, dazzled in accents of gold and, holds up to 300 patrons. It also features a music theme, expanded bar, cocktail tables, and private hospitality studios. The price to sit in the Billboard Lounge is dazzling, with a cost about a half-million dollars per year (though the Wall Street Journal priced it higher, at $550,000)—with a minimum three-year commitment. If you happen to be the deep-pocketed individual who springs for this sweet spot, you can hobnob with other business moguls in this area during Nets games, other sporting events, concerts, and family entertainment events. The Grant Thornton Loge Box offer lower-level seating location with convenient access to the VIP entrance so celebs can make a fast escape. These seats also have what Barclay's promoters call "spectacular sight lines," and all-you-can-eat food and non-alcoholic drinks. What Is Brooklyn's Barclays Center? What Is the Jacob Javits Center?